A three-judge panel of the 29-judge circuit earlier this year overturned a district court judge’s ruling that the bans couldn’t be enforced because the city allowed those type of signs in areas like the Hollywood sign district and the sports and entertainment district encompassing Staples Center and L.A. Live. Sign company attorneys then filed the petition for an “En Banc” rehearing before an 11-judge panel of the circuit. The companies have 90 days to file a writ of certiori with the U.S. Supreme Court, but unless the high court stays enforcement of the 9th Circuit ruling it becomes final as soon as it is recorded with the district court. In 2008, district Judge Audrey Collins granted the companies injunctions barring the city from enforcing the sign ban at a total of 43 locations, but once the 9th circuit order is recorded those injunctions would no longer be in force. However, in the past few weeks both World Wide Rush and Skytag have removed supergraphic signs at prominent locations, and it is not known how many are still up at the sites that were under injunction. 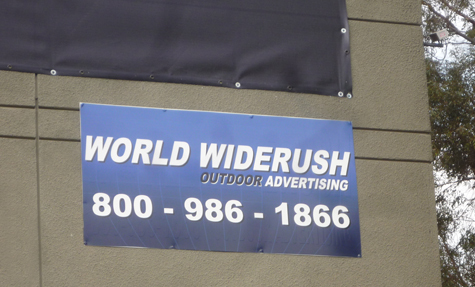 A number of other lawsuits challenging the sign ban were filed in wake of the original World Wide Rush decision in August, 2008, but action was stayed pending the outcome of the appeal. It is assumed that the city attorney’s office will seek dismissal of those cases.